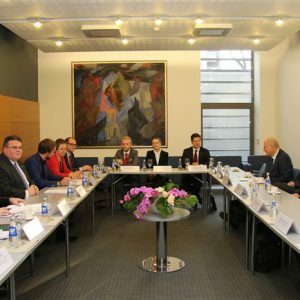 The “Rector Selection Saga” at the European Humanities University (EHU) in Vilnius, the Belarusian university in exile, has been going on for more than half a year. It enters its third season with the Governing Board’s Rector Selection Committee making every mistake in the book – again. It appears that the current Selection Committee (with no Belarusians on it) has no capacity to legitimise any candidate it would raise, especially after many criticised the process of pushing a hand-picked candidate, Dr. Garry David Pollick. By 1 March 2015 the Governing Board was expected to recommend a final candidate for the rectorship position to the General Assembly of the Part-Owners (GAPO). This, however, has not happened. Postponing the process further significantly increases the damage to EHU's credibility just as prime time for student recruitment descends upon the institution. This decision also pushes GAPO to take the initiative into its own hands and act without consent of the Board, for first time in the history of EHU. The current acting rector Dr. Garry David Pollick has incomprehensibly made his way through on to the final rounds of the selection process. He was introduced as a provost and COO of the European Humanities University slightly over a year ago and became EHU Acting Rector in October 2014. Pollick’s engagement at EHU has been marked by an astonishing rise to the top. But what did this candidate achieve in the year that he has lead EHU? And why does the Selection Committee keep pushing him to the top with such sustained vigour? The critical point in this whole discussion is how the Belarusian focus of the institution has lately become somewhat of a marginal idea. This problem – probably for the first time in the last 10 years – has finally engaged Belarusian civil society in a discussion of what the role of EHU is in developing the national project for democratic Belarus. Three months ago, 40 leading minds from Belarus and abroad signed in January 2015 an open letter calling to keep the ‘Belarusian heart’ of EHU and not abandon its legacy. Under Pollick’s leadership, EHU has suffered from the disastrous losses of reputation which, among other things, include unnecessary legal disputes over dismissals of former employees and breaches of the EHU Statute by particular administrative bodies of the university. Dr. Pollick oversaw a hiring process that gave rise to a budget deficit of nearly €1 million (there was no comparable budget deficit before). This caused major donors like the European Commission and Norway to suspend funding, pending a plan to reduce this deficit to a manageable size – a plan they have been waiting to receive from Pollick since last summer. One of his few accomplishments – a rather self-serving redraft of EHU’s Statute, created a University Council that Dr. Pollick boasted would help make EHU more democratic. According to the Statute, it is supposed to meet every two months. Dr. Pollick has not called a meeting of the Council in months. This is, very likely due to the fact that he decided that he can no longer work there with EHU’s CFO, who was asking uncomfortable questions about a number of financial matters that involve Dr. Pollick. Not surprisingly, a report released by Lithuania’s Centre for Quality Assessment in Higher Education in early February gives EHU poor marks for strategic management – the area that Dr. Pollick, probably the most expensive education consultant in the whole region, currently supervises. The university spent well over a hundred thousand euros on his compensation rather than on the development of academic programmes or campus renovations over the span of a single year. Presumably, the Board will no longer support Pollick, since few Board members are willing to take personal responsibility for choosing a candidate who has almost no support outside the Selection Committee. Unfortunately for EHU, a small group of influential and desperate Board members continue to push Pollick further along the selection process for the university's top post. According to some sources, last month, in an almost comically desperate effort to shore up their candidate, two individuals from the current EHU governance structures made their way to New York in the hopes of enlisting George Soros in their dubious adventure. Since George Soros is the founder and chairman of Open Society Foundation (one of three Part-Owners of EHU), his opinion on who becomes rector is of crucial importance. No surprise, however, that George Soros refused to support the legitimisation of a shady candidate and insisted on a fair selection process before it is too late. What else could select members of the Governing Board do further to discredit the current selection process? Arrange a “members only” Board meeting without the presence of student representatives and the EHU Trust Fund Manager (who are usually invited as observers) at Frankfurt Airport to further delay the final decision and keep Pollick on board as the most highly-compensated temporary rector in the history of Lithuania and Belarus for another month or two for the sake of an “exchange of opinions”? Fantastical as it may sound, this is precisely what they did. The airport meeting will take place at the end of March. If the EHU Board is so misguided as to nominate a candidate who has failed to perform the work for which he was hired, and GAPO to approve this, it will most likely mean a terminal loss of credibility for the European Humanities University as a whole. However, the current degree of dissatisfaction with the selection process may well warrant a negative decision by GAPO, should the Board decide to nominate Pollick. According to the EHU Statute, it is GAPO, not the Board, which officially appoints and dismisses EHU’s Rector and makes all fundamental decisions in the life of the university. GAPO could even dismiss the existing Governing Board, if it so chooses. If they were to reject a Board nominee or fully reboot the selection process, a new page of democratic governance would be opened in the history of EHU. GAPO has never voted against a Board decision before and is likely to act independently for the time in its history. Such a scenario would become a clear signal to alumni, students, faculty, donors and other stakeholders that GAPO takes seriously their obligation to properly govern and manage a Belarusian academic institution. If GAPO starts anew the search for a rector and dissolves the existing Selection Committee, Belarusians will achieve their first institutional success on the way to real engagement for change and this, in turn, will restore hope for a European future for Belarusian higher education, starting with EHU. That said, no matter who becomes a finalist at this point, given the existing selection process, without a new, reliable procedure, his or her legitimacy would be very low in many people's eyes. So now the question is not just who and how will actually become the next rector, but also whether the current Governing Board will continue to exist in its present form. Belarus tries to improve its economy and sends signals to the West that it is ready to carry out reforms to attract investment and secure loans. Besides reforms, Minsk has been pushing state-owned potash producer Belaruskali to win more of the marketshare, even if it means losing money. The EU views relations with Belarus pragmatically, making no guarantees. Despite the air of mistrust, Lukashenka has won the confidence of some policymakers in the EU that he is ready for reforms if the West is willing to support Belarus restore its image internationally with strategic issues. A local police force in western Belarus has decided to put out a controversial calendar for the public. The calendar in question features pictures of real female members of the police force, a move that has led to a mixed public response. All of this and more in this edition of the Western Press Digest. EU-Belarus Rapprochement Gaining Ground – Following Minsk's constructive role as a host and mediator in the Russia-Ukraine conflict, the EU is seriously weighing how to improve ties with Lukashenka. The Wall Street Journal reports that these warming relations are still only in their initial stages, but there are serious discussions going on in Brussels about how to improve ties while not ignoring Minsk's past record. Two issues under consideration, according to Latvian Foreign Minister Edgars Rinkēvičs, are easing visa restrictions for Belarusian citizens and supporting Belarus as it makes its bid to gain entrance to the WTO. Rinkēvičs also said that improving ties between the EU and Belarus should not be seen as trying to pull Minsk into the EU's orbit of influence. Diplomatic Barbs Exchanged with Kyrgyzstan – Following the murder of a prominent Kyrgyz mob boss in Minsk, ties between the two former Soviet republics are under strain. In their coverage of the diplomatic sparring match, RFE/RL reports that the conflict came about after a witness to the killing of Almambet Anapiyaev in Minsk said that members of ex-president of Kyrgyzstan Kurmanbek Bakiev's were involved. Belarusian authorities stated that an official investigation needed to be carried out and that the principle of 'innocent until proven guilty' made it impossible for it to hand over anyone to the Kyrgyzstani authorities until guilt was established. Kurmanbek Bakiev and his brother Janysh (then head of the state's bodyguard service) fled Kyrgyzstan in 2010 following the massacre of dozens of civilians who protested the then president's administration for its corruption. Bakiev contacted Lukashenka to ask that his family be given refuge in Belarus, after which the Belarusian head of state provided sanctuary for Bakiev and his entire family. Kyrgyzstan has demanded that Belarus return Bakiev, who was sentenced to life in prison in absentia for his alleged crimes. Winning Over Confidence With Reforms – A recent article by Euromoney says that the authorities in Minsk are doing their best to convince western policymakers and investors alike that they are embarking a series of reforms to improve the domestic economy's standing. Some of these reforms including freezing public sector wages at their current levels, slashing government support for state-owned enterprises and halting state sponsored projects that are not 80% or more complete. Like other countries in the region, Belarus' economy is struggling in the face of the economic downturn due to the conflict in Ukraine. According to Euromoney, the mantra in Minsk is that Belarus will make good on all of its debts this year, even if that means making cuts elsewhere. Still, most experts following the developments in Belarus are wary that any substantial change is underway – especially with the upcoming presidential election this fall. Major reforms, like the privatisation of state-owned enterprises, are still not on the table. Despite the sense that Minsk may not be serious about carrying out serious reforms, there is much optimism that rapprochement between Belarus and the EU is gaining traction and may open the door to stronger ties between the two parties. Belarus Pushing Potash Exports – Bloomberg reports that Belarusian potash producer Belaruskali is working overtime to get a larger share of the lucrative global market. Following the messy split with its Russian partner Uralkali, the Belarusian potash exporter has struggled to gain better control over the market and mantain its relevance. It has done this by selling to countries like Brazil and China for a discounted rate and is suspected of flooding the latter's market to the point that it is not interested in buying more due to its large surplus. As currencies decline in value across the globe, potash producers are seeing export costs drop as well – a development that is driving more competition. Man Detained for Writing on Fence – Based on an RFE/RL report, the BBC reports that a resident of Brest in eastern Belarus has been detained for keeping a public 'fence blog'. Mikhail Lukashevich has been writing on a city fence since the 1990s, but began regularly posting only around 10 years ago. His comments are typically confined to discussing current political issues and are critical of the authorities, according to the report. Lukashevich is under investigation by the authorities for 'defaming Lukashenka' and says that he may have to undergo psychiatric evaluation. The article notes that during the Soviet era he spent time in a psychiatric hospital in the past. Not Your Average Calendar – Female traffic police have made quite a stir in Belarus lately, but it is not their professional accolades that are drawing the public's attention writes the Daily Mail. The Mail's photo exposé, based on a report from Vocativ.com, has created some controversy, with some citizens calling it a 'desperate' move by the government, while others appear to be rather fond of the idea. While not entirely uncommon in the West, this is the first documented calendar of its kind in Belarus. Unique Underground Medical Treatment – An unconventional treatment for patients with lung ailments has taken foot in Belarus, reports the Daily Mail. According to the UK publication, children and adults alike are treated for issues like bronchial asthma and chronic obstructive pulmonary disease by breathing in the unique mineral-rich air found in an abandoned salt mine found some 1,400 ft below the surface. Treatment lasts for 19 days and is often repeated over a period of 2.5 years. Less one fret, patients sent to the underground facility treat it more as a period of leisure than treatment, as the treatment centre is full of things for them to do, including sport and games.